This project is being delivered as part of the national DEFRA programme aimed at delivering innovative natural flood management (NFM) across catchments in Cumbria. This programme came about, through the establishment of Catchment Management Groups (CMGs), following the winter floods of 2015. Natural flood management integrates complimentary strategies; including protecting, restoring and emulating the natural regulating function within catchments, i.e. rivers channels, riparian areas, floodplains and coasts. 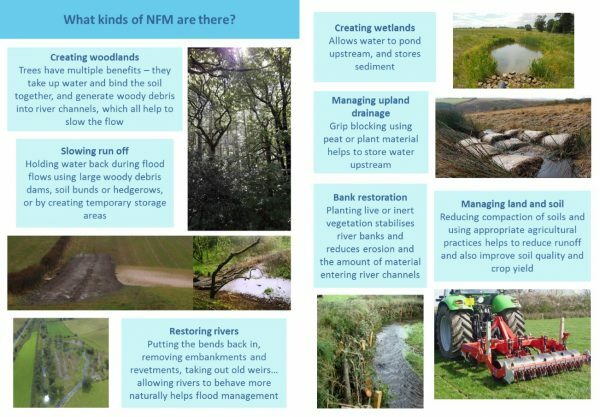 There are many different NFM techniques, that aim to reduce flooding by working with natural features and characteristics to store or slow down flood waters. The Rivers Trusts as well as Risk Management Authorities, Non-Governmental Organisations NGOs, Landowner Groups, Councils, Flood Action Groups, Highways England, Network Rail and DEFRA departments have supported the NFM pilot programme in Cumbria, their respective catchments, by identifying and developing targeted project interventions aimed at implementing natural flood reduction measures. The development of these interventions has been supported by Natural England, Forestry Commission and Environment Agency officers. 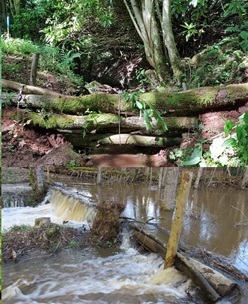 Reducing flood risk to a community at risk to a community at risk using natural or near-natural processes. Increasing our knowledge of how Natural Flood Measures (NFM) work and their effectiveness. South Cumbria Rivers Trust are currently working with partners and landowners to deliver NFM projects throughout South Cumbria. Please watch this space for further information about upcoming projects.